Clean out your closets, trailers and tack rooms! 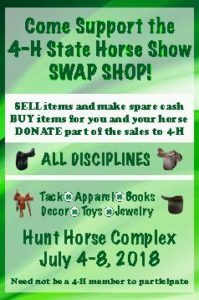 The 4-H Consignment Shop will be held during the State 4-H Horse Show. If you wish to consign items, follow the link to the online registration system on the Consignment Booth webpage. There is a 20% consignment fee, which goes to the NC 4-H Horse Program Educational Events Fund to support the traveling teams that attend national competitions. New for 2018, the Consignment Booth will be set up in the MD Barn, in between the Main and Covered Arenas. If you have consigned in the past and still have tags attached, you can transfer items from a previous sale to the 2018 sale. Instructions are on the website after you login. To set up an account and generate tags to sell items, please follow the links on the Consignment Booth webpage!